Or in other terms, my GoPro Hero3+ Black review. It's a bit long. So sit down. Or lean on a wall. Photo above is straight from camera taken with a GoPro at Barracuda Lake, Coron, Palawan, Philippines. I definitely needed an action camera so decided to get my own GoPro. There will be points in the review where I will be comparing stuff to the IOData action cam. For something so small and light without its case, its crazy how awesome the video and photo quality is on this thing! Can record up to 4K videos and 1080p at 60 fps? 720p at 100fps? That's awesome for something so tiny. And the 12MP wide angle photos? Magnificó. This is a photo straight out of camera, taken at Hale Manna, Moalboal, Cebu, Philippines. Isn't the quality super awesome? I'm not a professional photographer so don't take my word here seriously. What I like about GoPro's low light processing is it uses long exposure in low light cases. Unlike the IOData cam which just takes a snapshot in low light badly treats the pixels resulting in a very noisy photo. GoPro acts like a DSLR and performs a long exposure take. If you've got a steady hand, you can take quite a clear photo in low light. You can even make long exposure effects like light trails. The lenght of exposure can't be set though, but that's alright. The Hero3+ Black edition came with a free wireless remote controller. It works well as a remote but what I like about it is it sort of mirrors the LCD display on the camera so on the remote, you can see battery level, current mode, number of photos, etc. Pretty convenient if you can't get to your camera at the moment. The sad thing about the remote though is the very shallow waterproof rating at a measly 10 feet. Not very awesome for diving. I don't use it much anyway since I can get semi-timer photos using time lapse (more on this later). While the whole case can get scratch from pointy objects (including the glass protecting the lens), the whole build is super sturdy. I've taken my GoPro as deep as 100+ feet in dives and has fallen on solid ground a few times but it still works pretty well and hasn't flooded even once. Taken during a 20 feet fun dive at Nalusuan Island, Mactan, Cebu, Philippines. The crowd favorite: clownfishes. And get this: I got a cheap $20 monopod and had it attached to the camera. The whole thing fell from chest level and landed into cemented ground, GoPro head first. Guess what broke? The tip of the monopod attached to the bottom of the GoPro mount. The housing got some scratches but did you read about the part where the monopod broke instead of the camera? Being waterproof and all, I don't have to treat it delicately like I would my DSLR. So it's super travel friendly. The GoPro Studio is for download for anybody and works with any video from any camera. It's one awesome video editing tool! Very easy to use. Check out this video I made for our team trip in Camotes, Cebu. Edited with GoPro Studio. Pretty neat, huh? My favorite part about it is how easy it is to clip scenes on cue for better timing with the background audio. Please forgive the shaky hands. No, the GoPro is not perfect. What are you, a PSP from early 2000's? Seriously, I hate that I have to bring an extra cable for the GoPro because my devices are all micro USB except this GoPro. Ugh. This could have been placed on another area except the sides. In my usage, I keep hitting it and inadvertently switch on the WiFi. This usually happens when I put the SD card back into the slot and have to hold the other side (where the WiFi button is) for a bit of opposing force. Placing it in front would be cool, too. They could make the WiFi LED indicator a button. I'm a selfie king. I was used to IOData's 3, 5, and 10 second countdown timer for a photo. 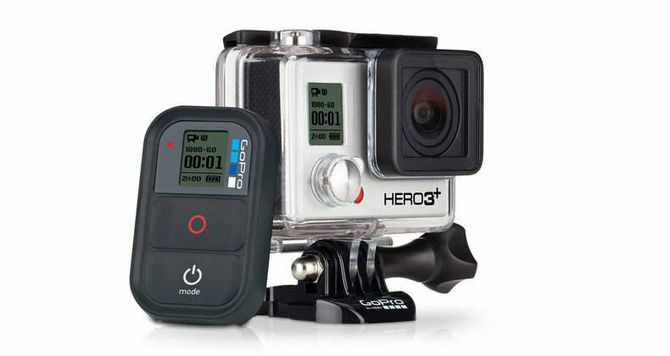 GoPro Hero3+ doesn't have this. What I do instead is use the time lapse. It's cool because we can do multiple poses while the time lapse takes a different photo every 2 seconds (configurable). The GoPro is used mostly outdoors, right? Sometimes in rough lighting, it's hard to see the info on the crystal LCD. Also when it gets dark, it's hard to see the screen with no ambient light in your direction. IOData's LCD was inverted and was white color on black background so it was easy to see the information. I wish GoPro had that. Always be sure to give the back cover a firm push into the case to keep it sealed tight. I have known of two instances that their GoPros flooded. Sometimes, just locking it in may not be enough. I notice if you don't securely push the back cover in, the back cover's plastic doesn't even touch the housing's plastic case. Only the rubber o-ring is in between. Could be the reason why it floods. Without a preview screen, it's great practice for creativity. Having no view finder, and no immediate preview of your taken shots, you have to master estimating angles and composing your shot well with the scope of the wide angle. It helps get more artful and resourceful with your shots! Seriously, at the price of the GoPro, it's a sweet deal with the video and photo quality it gives and the convenience of the size and sturdiness. Check out my posts on Instagram with #goproradj hashtags!